I’ve been working on a small house project over the past few days. 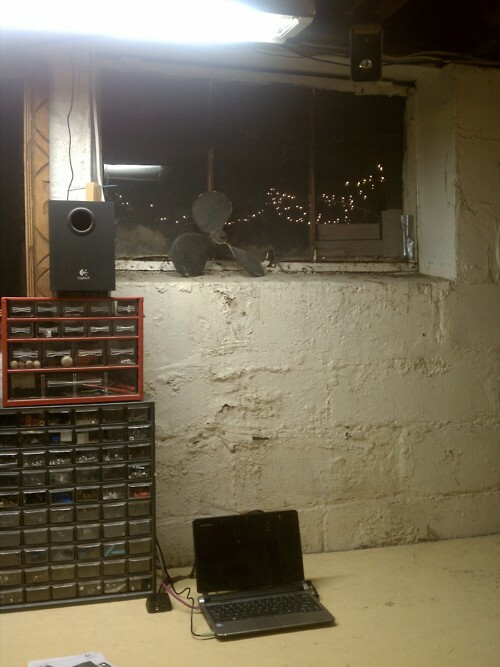 My house has a basement workroom, which I use for whatever I need to do involving pliers or a saw. I’ve been slowly outfitting it over the past few years, and one thing I wanted to do was to wire it for music. Not just a radio, but a computer that I could play sound file from, and stream audio. You can buy hardware for just that, but I’m cheap. I also wanted to keep it from looking like a computer desk; I have enough of that in my life already. This is a minor project; nothing like what you’d find on Instructables, but entertaining because it let me use DragonFly. 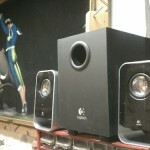 I purchased a set of cheap speakers from Newegg. 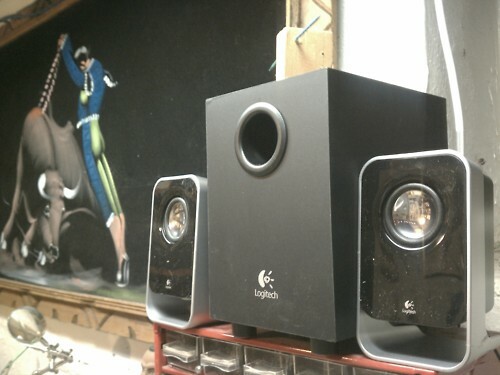 You’ll notice that the speakers have a metal frame that forms a loop at the bottom – that’s important later. I bought the speakers and hooked to a tiny netbook, running DragonFly 3.0.2. It works fine for playing music, though the case speaker doesn’t shut off when external ones are attached. That’s not a problem here, though, since it’s not loud enough to be audible over the separate speaker output. Those metal loops on the bottoms of the speakers turned out to be handy. I found some scrap wood, and built a small armature to fit inside the loop and hold it offset from the ceiling joist. 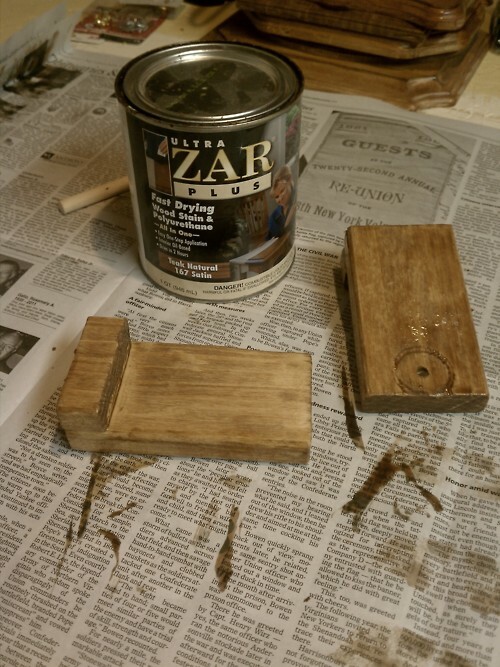 Both of these wooden blocks could have the speaker slide over it, upside down. 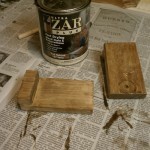 I stained both of the blocks so that they wouldn’t stand out against the dark wood of the workroom ceiling. I affixed the wooden hangers as far out as the cord on the speakers would let me, and slid the upside-down speakers onto them. There’s enough length in the cords to place the separate volume control dial on the workbench, and I’m done. You can see the ceiling speaker in the upper corner. How’s the sound? Okayish. You aren’t going to get much out of a set of speakers this cheap, but at least I don’t have wires over my work area, and I don’t have to worry about puncturing a speaker with a screwdriver by accident, or something similar. I can close the laptop to keep it at least somewhat protected. This is not a terribly complex project, but it makes me happy to have a DragonFly-based jukebox when I’m home. (This laptop usually travels with me.) I’m playing the music with mpg123, which is a surprisingly capable command-line player for files and for streaming audio. Sascha Wildner has updated mfi(4), the LSI MegaRAID SAS driver , via FreeBSD and LSI. SAS2208-based controllers are now supported. I just removed old pkgsrc binary packages for DragonFly 2.6/2.7 from avalon, so if somehow you are running a version of DragonFly that old, and still using binary packages, you’ll want to upgrade. I’m pretty confident that describes nobody. John Marino has changed the default search path for ldconfig; it no longer looks along /usr/lib/gcc* since that’s already included via rpath. The end result: you will need to do ‘make upgrade’ after your next buildworld build/installworld. I’ve seen a few people complain about poor video performance in DragonFly, in Xorg. If you see a bunch of “contigmalloc_map: failed …” errors in your dmesg, your video card needs more contiguous memory allocated. Set vm.dma_reserved to 32M in /boot/loader.conf and you should be set. If that doesn’t work, try 64M. A torrent for DragonFly 3.0.2, found via Google search. Which ISO or img files does it include? I don’t know. Which architectures? I don’t know. Is it legit? I don’t know. Click at your own risk, just like any other link. DragonFly 3.0.2 is out, and you can update (see /usr/src/UPDATING) an existing install or download a new one. This release turns off I/O APIC when booting in a VM because it caused issues for some users. Student applications for Google Summer of Code (and DragonFly) can now be submitted, until April 6th. Now’s your chance! This is the week of in-depth items to look at. I hope you have some time set aside… Also, I’m doing something a little different; since Lazy Reading articles are built up over the week, I’m scheduling it for early Sunday (EST) so that you can read it in your bathrobe, drinking an astonishingly large amount of tea. Or at least that’s what I’ll be doing. Apparently there’s a Russian version of BSD Magazine, with a special Russian-only article. Anyone who can read it willing to tell me what it’s about? Did you know BSD also stands for something bike-related? 70 Roguelikes! The 7-Day Roguelike Challenge, just completed, has 70 games out as a result. This will keep you busy, and there’s a very good writeup on several of the games to help you pick from the options. 20 Years of Adobe Photoshop. (via) I link it because almost everyone, sooner or later, has used it or has used a program with a very similar tool layout. Though I suppose you could argue it all comes from MacPaint, designed by Susan Kare, who happens to have also originated Clarus the dogcow. Moof! Man, Apple used to really have a sense of humor, too. Maybe they still do. Companies still do funny things (caution, autoplay video), but it seems to be done with the company’s marketing image in mind these days. Also, get your ball out of my yard you darn kids etc. Michael Lucas is teaching a SSH class at BSDCan 2012. Lucas also has also disclosed numbers on his recent self-publishing venture. I love seeing numbers like this because self-publishing discussion usually brings a whole lot of biases to the table, and people come down on one side or another because of what they want it to be, not because of what it is. (Like discussions of the music industry, piracy, and software.) This is just the plain numbers. Also, Absolute OpenBSD, second edition, is definitely his next book. Still on ssh, This Undeadly article talks about using OpenBSD, make, and ssh to speed up research. 20 iconic tech sounds bound for extinction. (via) Something in there will make you feel nostalgic. I like the 8mm film noise. Speaking of noise, here’s Famous Sounds, mostly electronically generated or sampled. (via) I guarantee some of these will be instantly familiar even though you won’t have heard the original song. Matthew Dillon has posted a link to the errata for the AMD CPU bug that he found. Venkatesh Srinivas has followed with a test case for the bug. Matthew Dillon also pointed out there’s a workaround to fix it, with no performance impact, it’s only found on revision 10h CPUs (not Bulldozer), and it’s extremely hard to duplicate. Why draw such a heavy line under that? The news of this bug rippled out through various news sites and was almost universally misreported, in a way that made it look bad for AMD without actually realistically quantifying the problem. Remember, it took 6 months just to find it – and he was looking for it! It runs from now to April 6th, so nothing but bug fixes in pkgsrc until then. If you have any package fixes you needed, now’s the time to ask someone. If you’re running bleeding-edge DragonFly (meaning version 3.1), you will need to do a full buildworld on your next update. ‘make quickworld’ will appear to succeed but the kernel won’t work. If you’re running DragonFly 3.0.x, this does not affect you. 2 Comments - Categories: DragonFly, Heads Up! Konrad Neuwirth is running Apache inside a jail, and getting some weird errors. Obviously I don’t know the fix, but Chris Turner knows what the settings need to be. Are you using old packages? We have pkgsrc binaries still around for DragonFly 2.6/2.7. As I posted, I’d like to get rid of them. Would that inconvenience anyone? We don’t have a set expiration policy. We probably should. A tip for anyone who hasn’t tried this yet: run irssi in screen, and connect to #dragonflybsd on EFNet. You can then resume your screen session at any time after disconnecting and see the backlog, catch people addressing you directly, etc. Before anyone says it: yes, I know, tmux works too. Carsten Mattner wrote out his notes on EFI booting on a Mac. This gets you closer to booting DragonFly on there, but I don’t think it is completely working yet. Update: Carsten Mattner has a better summation than what I wrote. That’s pkgsrc-2012Q1 I’m talking about. It appears KDE will jump from 4.5 (what’s there now) to 4.8, and Zope/Plone will be removed. This will make you happy or sad depending on whether you have these things installed. Do you have an HP laptop? If you do, acpi_hp could use some testing. Sascha Wildner just brought some improvements in for that module. I’ve seen discounted HP laptops show up in various places, recently. I’m making sure I post this Lazy Reading on the right day. A nice full week’s worth of stuff. Bandwidth used when loading different web pages. (via) The largest one is also the most surprising. Do you have an IBM x3550? Turn ACPI off. The recent TCL presentation at NYCBUG is available in audio form. This is totally useful if you’re using ssh from a Windows machine. SSH is used as a noun and a verb, I just realized. No link, it’s just me noticing verbification. BSDCan 2012 registration is open. (via Michael Lucas’s Twitter feed) Conventions are awesome. You should go. Michael Lucas talks about book promotion with his recent book. There’s a graph, so it’s automatically great. Speaking of books, Modern Perl: The Book is free to download in PDF form. A story about _why. (via) I’m not so interested in his identity, but in what he did to get people to program. My git habits. (Not mine; that’s just the title.) Speaking of learning, I’ve always thought the next steps past learning the basics of anything is to then see how experienced people approach it, idiomatically. Why Juniper Gives Back to the FreeBSD Community. I link to this because I like what they are doing, and also because in a perfect world I would rather have a BSD-ish interface on my networking equipment than fiddle with IOS. Oh well. Your unrelated link of the week: Neo Scavenger. (via) It’s a game, in Flash, and in beta. If you like postapocalyptic survival, it may be for you.